March is like a Thursday. By Thursday each week, most people are ready for the weekend. But you still have to slog through Thursday before you’re actually there. That’s how March feels. Because spring technically begins in March and the clocks change and fresh maple syrup starts appearing, I always associate March with spring. But it never quite gets us there. Spring is right around the corner, but we still have to slog through March. Winter running can be hard for a lot of reasons. It can be cold and windy and snowy, but one of the hardest parts for me is the disappearance of my “summer routes”. If you haven’t noticed from any of my other posts, I like to run on trails when I can. 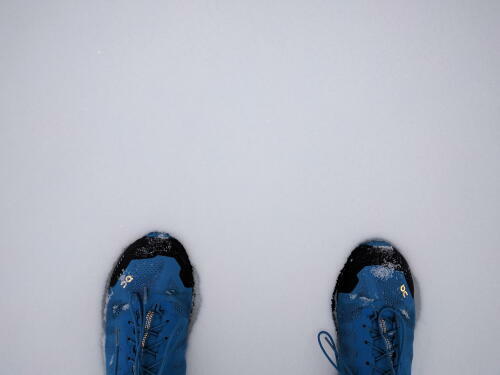 When the snow started accumulating I tried some snowshoe running, but my Achilles had other plans. Because of that, every one of my runs since mid-December has been the same 3.5 mile out-and-back route. The only change from day-to-day is how many times I repeat it. For a time in January, it looked like most of the snow may clear out enough to start venturing out on some of my “summer” runs. But as we all know, an entire winter was condensed into two weeks at the start of February, leaving me stuck in my winter route. Some days I felt like, Sisyphus, the poor soul in the Greek myth who was condemned to pushing a boulder up a mountain every day just to watch it roll down again and have to repeat the task for all eternity. While there are definitely days I have to force myself out the door to run the same thing again (see “Fake It ‘till You Make It”), I think learning to cope with the monotony of daily training is one of the keys to being a successful runner. The truth is, running is boring at times. It just is. You can try to compensate for that with music or by trying to run somewhere new all the time, but at the end of the day you’re still just running. Learning to love running just for the sake of running has been one of the most important lessons in my running career. Sure, I would still rather not run the same route every day for four months. But just the fact that I have somewhere safe to run and even the fact that I am physically capable of running greatly overshadows the monotony of my training right now. Make peace with the monotony of it all. Learn to love the process of training. And you’ll find yourself a better runner and person for it.